Along with our tent hire services, we also offer gazebo hire services in Durban and surrounding areas. If you are hosting a small event, arranging a product expo or setting up a market stall, our pop-up marquees are the perfect fit for you. Since such events often need to be set up in a short amount of time, our team of experts are always able to assist. We have a huge range of gazebos, and if your organization or company is planning a private party, a sporting event or a fun fair, these gazebos will definitely fit. Our pop-up gazebos are easy to install. Our technicians can pitch them on different surfaces such as grass or rocky areas and weights used to make them firm. Once you hire our gazebos, we will not only deliver, but also install it for you hence giving you more time and freedom to organize for your upcoming event. Our pop-up marquees come with aluminium leg poles and PVC covering. Besides, they also come in varying colours and sizes. They are made to withstand extreme weather conditions such as heavy downpour or heavy winds. Therefore, no matter the location of the event, you will not have to worry about the weather anymore. 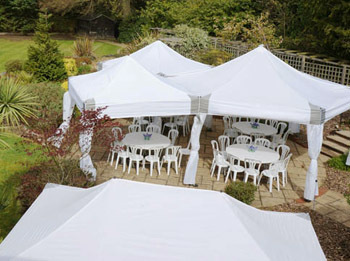 Are you in need of more than one gazebo for a fete of a fair? If so, we can assure you that we are well equipped to handle your small or large event. Our team will deliver promptly and set-up the product up at a time of your covenience. Our gazebos are available for unlimited rental, at reasonable prices. Our services are available in the whole of Durban and nearby Gauteng on short notice – we are sure we have a product to go with your event. Please feel free to call our gazebo hire Durban service on 031 100 1905 or send us an email. We shall be happy to attend to you and offer a satisfactory solution.